Thank you to everyone who participated in our Facebook marketing campaign! 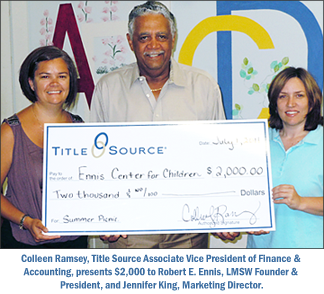 For every company page ‘like’ that Title Source received in June, we donated $1 to the Ennis Center for Children. Because of your help, we received 1,000 ‘likes’ from June 1-30th. Title Source matched those funds to donate $2,000! These funds will be used to support Ennis’ annual summer picnic on August 6, 2011.